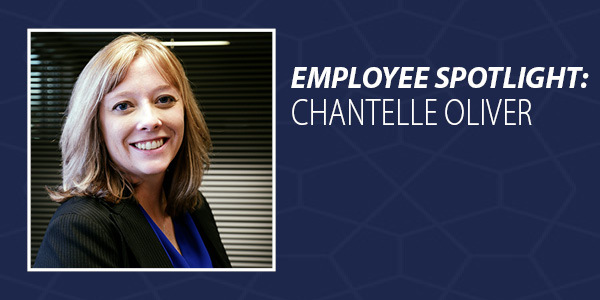 Employee Spotlight: Getting to know Chantelle Oliver…. Chantelle Oliver, CISR is the Supervisor of our Personal Lines Department. She is responsible for managing and supervising the Personal Lines Department while also maintaining the agency’s marketing and handling the new personal lines sales. We spent some time asking her a few questions so you can get to know a little more about who you’re working with when you talk to Chantelle. Chantelle has been working in the industry for about 10 years. She started out with a nursing career, but when loans ran out, Chantelle joined the Army. Unfortunately, due to issues with her knees, she was unable to leave for boot camp and her doctor recommended she find a job where she could sit down. This is where her career in the Insurance field began. She found a job as a receptionist at an insurance agency and worked her way up! Chantelle is married to her best friend, Jacob. They have 3 dogs, Daisy, Izzy, and Porter, and just welcomed a baby girl named Finley on January 3rd 2016! If you could have one super power, what would you choose? I would want to fly! Favorite recipe? Willing to share it? Whatever my husband cooks. I am sure he would share! If you were stranded on a desert island and were allowed to bring 3 things, what would they be? My husband (He is always equipped with a knife and a fishing pole), chapstick, and strap my two little dogs to the big one so I could bring all 3. Have you ever been told you like a celebrity? If yes, who? Nope. Too unique I guess. What is your biggest pet peeve? When people tailgate while driving. What is your worst fear? Bees. What is something no one at the office knows about you? All my socks are categorized by “rights” and “lefts”.